Noiseless spring-free design, for both commercial and house use, adjustable and removable handlebar. 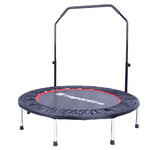 Spring-Free Trampoline with Handlebar inSPORTline Cordy 114 cm is a special type of trampoline without springs. The jumping mat is attached with 32 flexible loops. This way, you can jump noiselessly, without any disturbing metal creaking. Since there are no hard components near the jumping mat, it is safer to use. Eight steel leg supports with rubber caps support the entire frame that can withstand up to 110 kg. The jumping mat is made of high-quality anti-slip and waterproof material. This product features a practical handlebar which you can grasp as a support while jumping. Its height can be adjusted according to the height of the user. If you don't want to use it, it can be removed. 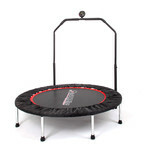 Spring-Free Trampoline with Handlebar inSPORTline Cordy 114 cm is suitable for dynamic fitness exercises that combine quick and slow jumps with quick intervals or power exercises. Such workout can have a beneficial effect on your cardiovascular system, lung capacity and endurance. What's more, you can use it for whole-body training. It is suitable for both commercial (fitness studios and centres) and home use.